New Hanover County offers a competitive benefits package designed to encourage and support your health, well-being, and productivity. Benefit options include medical, dental, vision, numerous supplemental benefits options, contributions to the North Carolina Retirement Plan, paid leave, and 100% employer paid long-term disability. Employees who elect medical, dental, and vision coverage within the specified timelines provided during on-boarding will have their insurance coverage effective on the date of hire. New Hanover County offers three health insurance plan options that are administered by Blue Cross Blue Shield of North Carolina. Choosing the right health insurance plan is an important decision. Take the time to learn about your options to ensure you select the right plan for you and your family. The Buy Up Plan has the lowest deductibles but the highest employee premiums. This plan can be paired with a Flexible Spending Account (FSA). FSA’s set aside money from your paycheck pre-tax to be used to cover healthcare and childcare costs. The funds in an FSA cannot be rolled over year to year. The Base Plan has lower employee premiums but higher deductibles. This plan can also be paired with a FSA to cover healthcare and childcare costs. 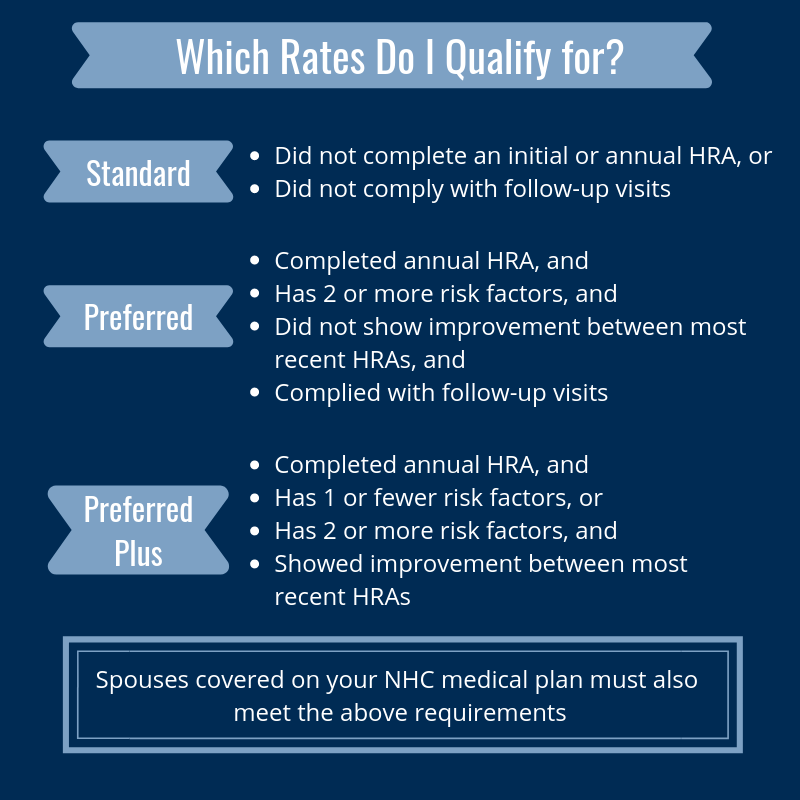 The HSA Plan is an option with the same deductibles and premiums as the base plan, but can be paired with a Health Savings Account (HSA). A HSA is a personal bank account that you can use to pay out-of-pocket healthcare expenses with pre-tax dollars. Money deposited in the account stays with you regardless of employer or health plan, and unused balances role over from year to year. NHC will also contribute to an employee’s HSA between $750 and $2,250 annually. Employees are encouraged to participate in the Insurance Premium Wellness Incentive Program to qualify for significantly reduced insurance rates. Read more about this program under the Wellness panel. Employees who elect medical coverage through the plan options will have their insurance coverage effective on the date of hire. Retired military can elect a Tricare supplement. New Hanover County also offers dental insurance though Delta Dental. In-network benefits include two cleanings per year and full x-rays once per year. It offers an orthodontia benefit for children under 19 years of age. Employees who elect dental coverage through the plan options will have their insurance coverage effective on the date of hire. Long-term disability is provided and paid 100% by New Hanover County. Benefits are effective on the 91st day of the employee’s disability, and can continue up to two years. The plan pays 60% of your gross income. Short-term Disability is guaranteed issue for new hires and is offered as income replacement in the event of the employee’s short term accident or illness. Benefits are effective the 1st day of an accident and the 8th day of an illness, and can continue up to 13 weeks. The plan pays 70% of your gross income. Rates vary based on age and salary. This plan will pay indemnity daily for up to 15 days for every day an employee is an inpatient in a hospital and/or a one-time benefit for outpatient surgery, diagnostic testing, ICU confinement, and a health screening exam. This plan allows employees to pay for their personal and dependents’ out-of-pocket healthcare expenses, and childcare expenses, with tax-free money. This plan pays an annual benefit toward the cost of frames, lenses, and contacts. Employees who elect vision coverage through the plan options will have their insurance coverage effective on the date of hire. This plan will pay benefits to an employee or dependent based on the expenses incurred due to a diagnosis of invasive cancer. This plan will pay benefits to an employee, and/or eligible dependent(s), that has had an accident off the job. Benefits are determined based on the type of accident. The plan also has an annual wellness benefit. Term Life and Accidental Death insurance plans are guaranteed issue for new hires and their dependents. Guaranteed issue for new hires, this plan pays an initial diagnosis benefit of $10,000 for illnesses such as heart attack and stroke. It can sometimes be difficult to juggle all that life hands you. New Hanover County understands that occasionally you may need some help in maintaining the balance between your work and your personal life. The New Hanover County Employee Assistance Program is available to all county employees and is designed to support you with a variety of resources including managing finances, stress, legal issues, or individual, couples and family counseling. These services are all free to county employees and their household family members. We want you to know that we are here to help keep you safe, happy, and successful in both your professional and private life. Eligible employees become members of the North Carolina Local Government Employee’s Retirement System (NCLGERS). Contributions are paid by the employee and New Hanover County at a rate determined by the State Department of the Treasurer, Retirement Systems Division. Employees are vest after 5 years of contributing. You become a member of LGERS as a local law enforcement officer on your hire date if you are a permanent, full-time paid employee of an employer, who (i) possesses the power of arrest, (ii) has taken the law enforcement oath administered under the authority of the state as prescribed by G. S. 11-11 and (iii) is certified as a law enforcement officer under the provisions of Chapter 17C of the General Statutes or certified as a deputy sheriff under the provisions of Chapter 17E of the General Statutes. You may retire with an unreduced service retirement benefit after you: Reach age 55 and complete 5 years of creditable service as an officer, or complete 30 years of creditable service at any age. The NC 401(k) Plan is a retirement savings plan available exclusively to North Carolina public employees who are actively contributing to one of the NC Retirement Systems. North Carolina state and local government employers offer this Plan to help you reach your retirement savings goals. Payroll deductions you can start and stop at any time. Tax-deferred savings that can reduce your current taxable income. Easy-to-use planning tools and personalized assistance. Simplified investing tool that helps take the guesswork out and keeps you on track. Transfer options into your pension plan from your NC 401(k). As both 401(k) and 457 (b) options are funded when employees contribute through payroll deductions; participants of each plan set aside a percentage of their salary to put into their retirement account. These funds pass to the retirement account without being taxed, unless the participant opens a Roth account, and any subsequent growth in the accounts is not taxed. These options are both 100% employee paid. As both 401(k) and 457 (b) options are funded when employees contribute through payroll deductions, participants of each plan set aside a percentage of their salary to put into their retirement account. These funds pass to the retirement account without being taxed, unless the participant opens a Roth account, and any subsequent growth in the accounts is not taxed. These options are both 100% employee paid. The onsite WAY Health Clinic is a free, confidential, and convenient health resource for all regular benefits-eligible employees, spouses, and dependent children (age 13 or older) covered by the county’s Blue Cross Blue Shield of NC medical plans. To encourage use of the facility, employees are provided with a special Wellness Clinic Leave for visits to the clinic. Learn more in Leave panel below. New Hanover County employees can participate in this program and qualify for lower insurance rates. To qualify, employees must participate in a free Health Risk Assessments (HRA). HRA’s are done prior to the employee’s date of hire and annually in the spring. Any spouse covered on the employee’s county medical plan must also complete a HRA. The HRA measures your blood pressure, height, weight, waist, pulse rate, and fasting blood test for cholesterol, triglycerides, glucose, and PSAs (males 45 and older) to find out more about your health and ways to protect it. Check the Benefit Rates link at the top of the page for current insurance rates, including the reduced rates for employees who qualify for Preferred and Preferred Plus. Participation in the Wellness Incentive Program is voluntary. Wellness Challenges encourage employees to engage in healthy behaviors, like eating healthy and being more active to support healthy lifestyles. Wellness Education opportunities are provided monthly with health professionals and subject matter experts presenting health classes on helpful information as well as lifestyle tips to reduce risks for chronic health conditions. Successful participation in wellness challenges may also earn employees Wellness Incentive Leave. Learn more in the Leave panel below. This innovative physical therapy and rehabilitation program is made available at no cost to our employees, spouses, and dependents (13 years and older) who are covered on the county’s BCBSNC medical plan. Employees have access to an onsite fitness studio and group fitness classes. The WAY program encourages healthy, active lifestyles. Physical activity is known to greatly improve personal health and well-being by reducing your risk for various diseases (diabetes, heart disease, high cholesterol, etc.) as well as improving energy and sleep habits, and reducing stress. SERVE (Succession, Evolution, Retention, Viability, and Engagement) is New Hanover County’s nationally-recognized initiative for talent development. SERVE is the all-encompassing umbrella under which we deliver our training and professional development for you to deliver the best service to our citizens and to one another. In keeping with our commitment to public service, and with our efforts to align all of what we do to deliver our model of good governance, SERVE is the platform to help us be our best and do our best. New Hanover County leaders and supervisors have the responsibility to grow and develop employees in the enterprise. Whether that means to support employees in being the best and fully engaged at their current job, or to see them grow into different areas of greater responsibilities, we want our employees to be empowered, equipped, and engaged. Each of these initiatives for employees are opportunities for professional growth and development in the enterprise. PCU is New Hanover County’s online training program, underpinned with one of the world’s leading online training developers, Skillsoft. With courses in customer service, safety and compliance, business acumen, and the latest in software and computer training, you will be able to access almost any skill-set that you need, when you need it, to make the best out of your learning experience. New Hanover County’s Continuous Improvement Training presents customer service training for all county employees at all levels of employment. The goal is to enhance, hone, increase, engage, and develop our own personal delivery of service to the citizens of the county and to one another. These trainings are in keeping with our Model of Good Governance by effectively delivering on the goals we set in our strategic plan. New Hanover County prides itself on our customer service. We strive to make every customer’s experience with their local government as easy and pleasant as possible. We offer several unique customer service classes for employees, tailoring each experience towards the group’s specific needs. Our certification program is a way for employees and departments to show their commitment to serving their customers with an elevated level of respect and professionalism. Employees can achieve three certification levels: Ambassador, Consultant, and Champion. Wellness at New Hanover County is not just about eating right and exercising. We take a holistic approach to wellness, incorporating learning opportunities into our schedule each month. You will find a variety of topics designed to improve your overall wellness both at work and in your personal life. Topics include financial wellness, mental wellness, stress management, heart health, exercise techniques, nutrition, and more. Stellar Awards are given to employees who have excelled on the job in ways aligned with the county’s shared values of professionalism, integrity, innovation, stewardship, and accountability. These awards are given to any county employee who exemplify one or more of these values in their work. Employees are nominated by a coworker or citizen, and the county’s Recognition Committee reviews applications for the final awards. Stellar Awards are given monthly and at the end of the year. All Stellar Award recipients will be invited to the Reaching for the Stars Banquet. In addition to the recognition, each recipient of the award will receive a certificate, a star pin signifying the shared values embodied, and a $25 gift certificate or 4 hours of leave. The Five Star Award is the county’s highest award. This award represents the achievement of attaining five separate Stellar Awards in at least four of the five shared values. Recipients of Five Star Awards will be invited to that year’s recognition banquet, receive a trophy which signifies their achievement, and a $100 gift card or 8 hours of time off. You serve the community every day just by being a New Hanover County employee, but so many of us serve outside the scope of our jobs by being engaged in our community in other ways. The Community Service Award allows us to nominate our coworkers and give recognition to a county employee who has served the community through volunteering, mentoring, serving on non-county appointed board, civic engagement, charity work, fundraising, etc. Community Service Award recipients will be invited to the Reaching for the Stars Recognition Banquet and will receive a certificate. Service Awards are given to employees who have worked with New Hanover County for 5, 10, 15, 20, 25, and 30+ years. 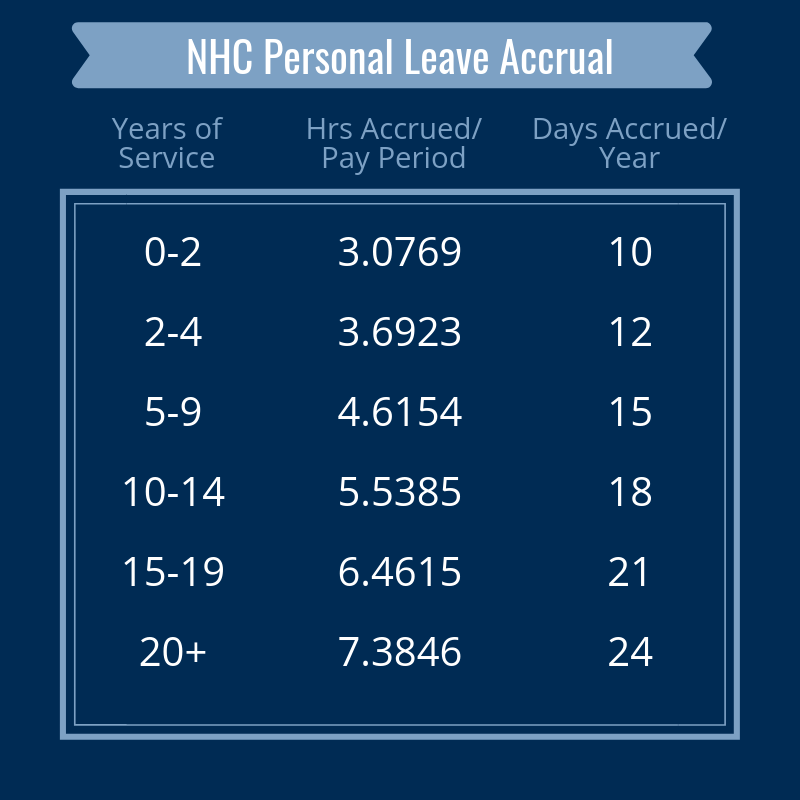 Regular, benefits eligible employees who work more or less than 2080 scheduled hours per year have their personal leave accruals prorated accordingly. Regular, benefits-eligible employees will accrue 96 hours of sick leave for each year of completed service. Sick leave will be cumulative for an indefinite period. The balance of unused sick leave will not be paid to the employee upon separation. 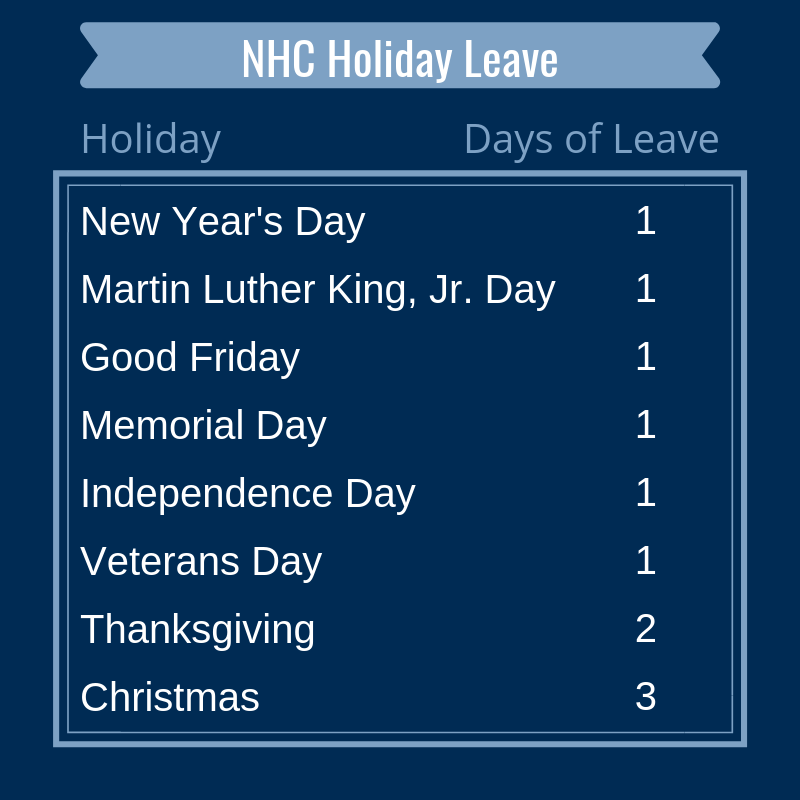 Active enrollees in the NCLGERS may transfer up to 96 hours of accumulated sick leave balance upon employment. After 5 years of service with the county, the remaining balance of prior sick leave will be transferred to the employee’s sick leave account. For retirement purposes, all unused sick leave transforms into creditable service. For every 20 days of unused sick leave the retiring employee has, he or she receives one month of creditable service. Employees may be paid for up to eight (8) hours of Community Service Leave each year. Leave must be used for participation in school activities with their children or in volunteering their services in the community during normal working hours. The county provides an on-site wellness clinic to regular, benefits-eligible employees. To encourage use of the facility, which positively impacts both employee health and medical insurance costs, employees are provided with a special leave for visits to the clinic. The Wellness Incentive Leave Program provides an opportunity for employees to earn additional paid leave for completing proactive healthy behaviors towards achieving and maintaining good health. Participants complete online wellness challenges and become eligible for wellness incentive leave. Successful completion of one online challenge awards participants four (4) hours of wellness incentive leave. The county recognizes the need for an adequate blood supply, and to encourage participation in the county blood drives for the American Red Cross, employees are provided with paid leave for successful blood donation. For each successful donation, an employee is credited with four (4) hours of paid leave. Employees may not accrue more than 16 hours in a year. There is no maximum accumulation, but this leave will not be paid out at separation. New Hanover County will observe the same holiday schedule as designated by the Office of State Personnel. The amount of time allowed for a paid holiday is based on the number of annual hours for which an employee’s position is budgeted. If employees’ normal work schedules are other than the standard 2,080 hours/year, their holiday pay may be pro-rated based on the number of hours budgeted for their positions. Fire Rescue staff scheduled to work 24-hour shifts receive 12 hours of holiday pay for each holiday. New Hanover County holds Employee Appreciation Events to thank all county employees and their families for their service, and to strengthen relationships within the organization and in the community. County employees are offered discounts to various businesses on an on-going basis including local arts, culture, community, and sporting events.